Monday March 14th 1904 It was such an unpleasant day. I was busy with the work and a little sewing. Mollie got home for her dinner. The men were busy most of the day shoveling snow. I read in evening. Tuesday March 15th 1904 It warmed up some today. Will churned for me in the morning. I dressed chicken and got dinner. In the afternoon I did quite a washing. Mollie went to town to stay all night. I read all evening. Wednesday March 16th 1904 I got the ironing done today by finishing some after dinner. I then did mending and got the supper. I read most of the evening. weather cloudy. 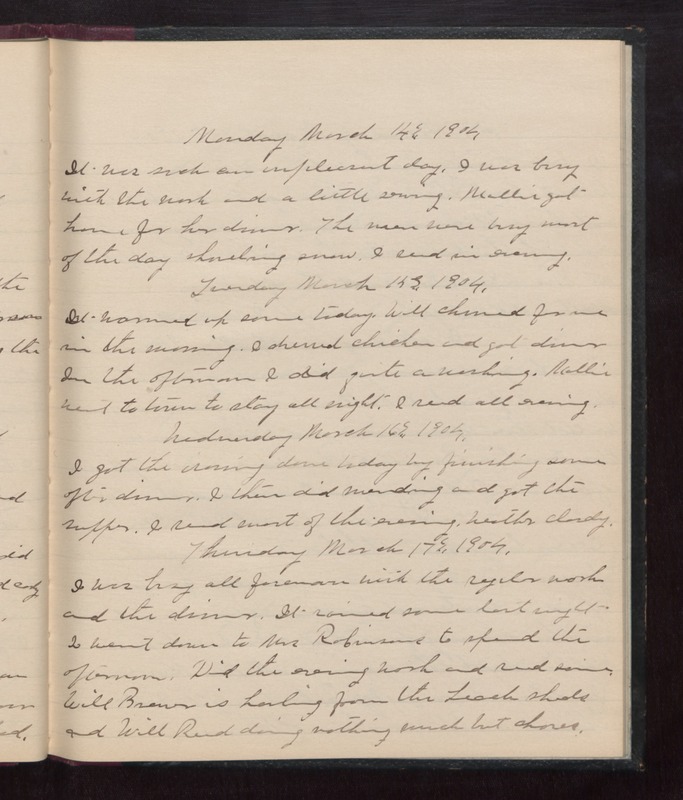 Thursday March 17th 1904 I was busy all forenoon with the regular work and the dinner. It rained some last night. I went down to Mrs Robinsons to spend the afternoon. Did the evening work and read some. Will Brewer is hauling from the Leach [sheds?] and Will Reed doing nothing much but chores.